Heat oven to 350°F. Line two muffin tins. Stir together sugar, flour, cocoa, baking powder and soda in large bowl. Add eggs, milk, oil and vanilla and beat on medium. Slowly stir in the orange juice until it’s fully absorbed. Add chili powder, ground cinnamon and ground cloves and stir into the mixture. Spoon the batter a little over half-way full into the cupcake wells and bake for 15-20 minutes. Cool completely. Prepare the frosting (recipe below). Place the red pepper flakes into a saucer. Spread the frosting evenly over the top of the cooled cupcake and delicately roll the edge of the cupcake into the crushed flakes. 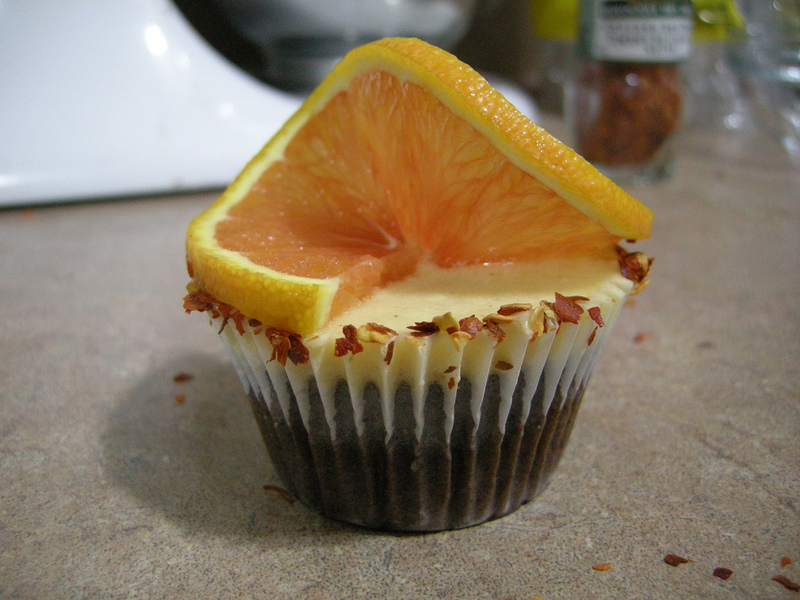 Top the cupcake with an orange slice. Cream butter until light and fluffy. Add mango, lime zest and juice and honey and beat well. Mix in icing sugar one cup at a time. Mix in chili pepper and tabasco sauce to your liking.